Catty, captivating, and ultimately vulnerable, M.C. Beaton’s Agatha Raisin mystery series returns in book eight when Agatha, after a botched home dye job to hide her grey hairs, ends up meeting and falling for a charismatic hairdresser, Mr. John. The romance is soured somewhat by gossip and suspicion, particularly the fear of local village women. When John dies gruesomely before finalizing Agatha’s new coiffure she senses foul play and, with James once again gone, teams up with the inimitable Sir Charles and her plucky ex-assistant Roy to track down a killer all while distracting herself from aging and her lovelorn position. Corny? Come on, it’s a cozy mystery; what did you expect? Regurgitated plot elements (i.e. strong, tough Agatha is actually protecting her weaker self from commitment and love), yes. Once again, it’s a cozy mystery. 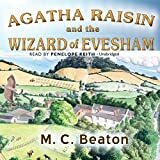 I’ve read many reviews of Agatha Raisin and the Wizard of Evesham and I agree with many readers that as far as realism is concerned, Agatha’s storyline in general and this book in particular don’t fit into the real world. But then again, that could be said for the entire cozy mystery genre which is appealing because of its warmth and atmosphere, not its logical conundrums and highly detailed clues. That’s what the hardboiled mysteries are created to satisfy. Here, we seek to reconnect with old friends in a beautiful setting, have a little emotional rollercoaster for some tension and fun, and play at murder mystery. Many state that by book eight, Agatha and her on-again off-again relationship with James, plus her ever more teenage longing for him, has grown stale, even by cozy mystery standards. And . . . well, ok, I concede that one. It would be nice if M.C. Beaton chose to move away from the James plotline for new horizons and further character development of Agatha. While the series does hurt from this sameness, it certainly isn’t destroyed. By book eight, the audience has accepted both the strengths and the faults and, if you’re still reading, you’re reading for all the good qualities still very much in evidence: the atmosphere, the characterization (in that all of our characters are distinct and lovable, if not always very smart with love), and Agatha’s hilarious quips. Besides Agatha, strong business woman that she is, has always been a loner, protective of herself because she feared rejection. Maybe it’s not so hard to believe that when she finally does start to let her barriers down there are a lot of dips and swings, and ultimately she turns to the wrong people while searching out the right ones. Sorry, I love Agatha and my compassion and sympathy are stirred. Aren’t many of us creatures of habit? Don’t we secretly want to connect with a character more like ourselves: an average person who, as with Agatha, gets involved in extraordinary circumstances? Isn’t that the appeal of cozy mysteries? The mystery itself is not among the strongest, and as with the last several books, Agatha stumbles into the answer more than she arrives at it. The series does certainly contain stronger mysteries later (I’ve read out of order); however, Wizard of Evesham is enjoyable if not especially memorable for the villain and surrounding characters. The voice acting of Donada Peters, who read my audio book edition, truly made the surrounding characters and their evasion plus downright rudeness amusing during the investigation, putting readers into a world that on the surface may not be impressive, but has certain depths and intrigues which pull readers in nonetheless. The decision to include Sir Charles in Agatha’s adventures again served as a pleasant surprise. Both a cad and yet, oddly, a gentlemen, Sir Charles is an appealing character in that we love to hate him and also hate to love him. He has more depth and complexity and adds to the investigation with his theories and contributions to Agatha’s waning sleuth spirit. 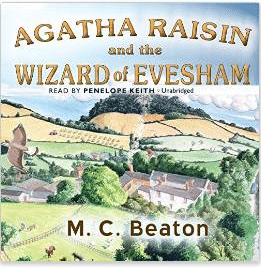 Agatha Raisin and the Wizard of Evesham was a worthy edition to the series; cozy, dramatic, funny, and sometimes sad, this particular novel twists into a darker world for Agatha; while increasing her mental turmoil, the series is adding more characters to the fray, giving our lovable sleuth some downtime, and gearing up for what is to come in later novels. Recommended.